What does a painting—made 150 years ago or more—say about the places or the people or the buildings it depicts? Does it say merely one thing? Or more? Is such a painting to be seen primarily as an expression of artistic talent and individual perception? Is it the equivalent of high art? Is it a picture postcard? Or is it a historical document? Especially when it records ways of living or places that have disappeared? And if they have completely or partially disappeared, how does one decide how accurately they are recorded in such paintings? In other words, what do we make of such paintings? How do we understand them, appreciate them, utilise them? As a professional architect working in the field of conservation and history, early depictions of monuments, cities, gardens and landscapes of India interest me greatly. 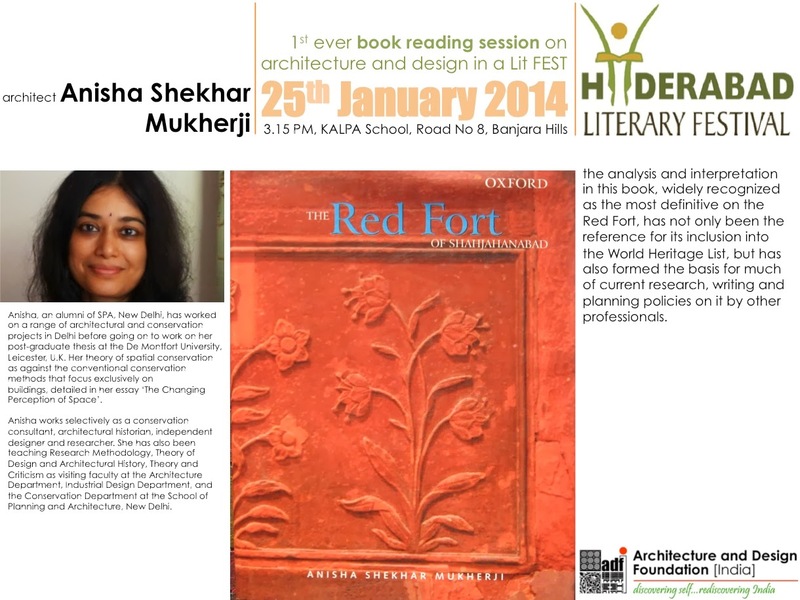 I remember my elation some years ago on finding two drawings of the Mughal Red Fort of Shahjahanabad drawn by British artists in the mid-19th century. The Red Fort, as we all perhaps know, is one of the most unique urban palace complexes in the world—and one which has only 10 percent of its original structures remaining today. Hence my elation, at finding (or so I thought) vital information that could help me to piece together how the inside of the 17th century Fort looked before so much of it was destroyed in the War of 1857 and its aftermath. My elation soon gave way to surprise. The drawings portrayed a different scenario altogether. Where was the complex configuration of the Red Fort’s many courtyards? And its palaces, pavilions, gateways, streets, and orchards within and around these courtyards? On comparing the drawings with archival records as well as the existing Mughal buildings in the Fort, I realized that the drawings employed a great deal of artistic license. So much so that the inner features of the Fort and even its outer profile were almost completely transformed in these drawings! In place of the successive airy arcades of the many single-storey palace-pavilions punctuated by marble screens and cooled by fountain-courts and gardens, there was one towering building sitting isolated within an open area. It was in fact, the image of a stately English home entered through a wide driveway flanked by trees and shrubbery, made Oriental with a generous topping of bulbous onion domes! Since then, I have been cautious about deriving any direct clues about historical places from such paintings. That does not nonetheless imply that they are useless as records. On the contrary, these paintings do give important information especially when they depict places which are not as complex or as large as the Red Fort. And they say as much about the places they represent as about the people who drew them and the times in which they were painted. They are not just ‘ways of seeing’ but also ‘ways of saying’ whatever individual artists thought was important to represent. Even the act of choosing to draw a particular monument out of hundreds of others, is an expression of an artist’s way of saying something. But how does a viewer in the 21st century understand and interpret these ways? Let me try to explain this through the example of two architectural monuments featured in the present traveling exhibition. Even if one did not know anything about when and how these paintings were made, it is quite easy for a viewer in the Indian context to understand what they are saying. Most of us would easily recognize the sites that these two paintings depict. The structures are drawn quite recognizably for what they are. It is unlikely that any viewer, especially a Dilliwala, would confuse them with any other historical building.the first is quite evidently the Jantar Mantar at Delhi, and the second is the Jama Masjid in Shahjahanabad or old Delhi as most of us refer to it today - both important ‘monuments’ in the built landscape of Delhi. The way in which the people and the surrounding topography and landscape are shown in these drawings, quite clearly places the images in a time that is past. So what they are saying and their way of saying it seems quite realistic and straightforward. But is it? When we come to know when they were painted and in what circumstances, we realize that there is much more to them than meets the eye at first glance. To begin with, how we see them now is not the way in which the artists expected them to be seen. Ironically, these paintings were never meant to be seen primarily by Indians or even by Europeans living within India. They were painted for a European, particularly a British audience back in Britain, who would have had an interest in India, through relations, friends or even personal visits at some time to this country. However, whether or not they had been to India, these two sites would have been familiar to most of them even in the 19th century. Why? Because Delhi, as the imperial Mughal capital since 1648 ad, was frequently visited by travelers. Some of these travelers left written accounts of their journeys which were published and circulated widely in their own countries. Hence, the choice of the Jama Masjid and the Jantar Mantar - both arresting, unusual and important buildings in Delhi, and both well-documented in the accounts of earlier travelers. So, for instance, the Jama Masjid, whose construction was finished in about 1658 ad, is described just five years later by the Frenchman Francois Bernier, one of the earliest Europeans to have lived in and written about Shahjahanabad, the ‘new Delhi’ of that time. Bernier describes ‘two edifices worthy of notice’ in this city apart from the Red Fort (p. 278), and one of them is the Jama Masjid, ‘the principal mosque which is conspicuous at a great distance’. He writes (p. 279) about ‘the ascent to the three gates by means of five-and-twenty or thirty steps of beautiful and large stones’, ‘the three magnificent entrances’ and that ‘Above the principal gate, which greatly exceeds the others in grandeur of appearance, there are several small turrets of marble that produce a fine effect’. In short, he gives a complete verbal picture of the scene that we see in the painting above! Not just this, Bernier goes further and declares ‘I am satisfied that even in Paris, a church erected after the model of this temple would be admired, were it only for its singular style of architecture, and its extraordinary appearance’. Bernier’s writings dedicated to King Louis XIV of France were published in Paris in 1670 and its first English edition followed barely a year later. John Dryden’s play Aurangzebe first acted at the Royal Theatre in London in 1675 and revived again in the early 18th century, was derived from Bernier’s text. Thus, the Jama Masjid, already known to a European audience through texts, and associated in their minds with the might and magnificence of Shah Jahan and Aurangzeb, was a natural choice to be depicted in paintings. The Jantar Mantar, too, though not as old as the Jama Masjid, was a site frequently visited and written about. Barely twenty years after it was made, the Austrian Jesuit missionary Josef Tieffenthaler visited and wrote about the Delhi Jantar Mantar. In another 50 years, by the end of the 18th century, the Delhi Jantar Mantar’s value was recognized as an Observatory and it was written about in the Asiatic Researches published from Calcutta, first in an account of Delhi by W. Franklin who went to Delhi with a party of surveyors dispatched by the East India Company Government of Bengal, and later by William Hunter in a specific account of the astronomical work of Sawai Jai Singh, the King who established the Observatory. By this time the Observatory was ‘celebrated’ enough to warrant a visit not just by travelers ‘in search of the Picturesque’ (such as Fanny Parks) but also professional soldiers such as Major William Thorn who stopped here ‘on way back to camp’ as a member of Lord Lake’s campaign in Delhi sometime in September 1803. It was also valued on account of its association with Sawai Jai Singh, who was portrayed as a just and model king, different from the conventional western image of Oriental despots. 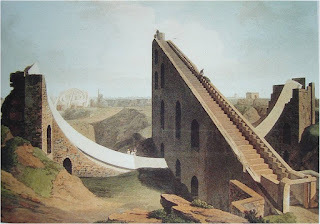 So the Jantar Mantar was well known in both scholarly circles as well as in popular travel accounts. Paintings of the Jama Masjid and the Jantar Mantar featured in many 18th and 19th century artists’ works. The pencil and watercolour drawing of the Delhi Jantar Mantar in the present exhibition, was drawn by William Simpson, (on Paper, 1864, V&A Museum 1146-1869). It is described as ‘one of Simpson’s most romantic paintings’ in the Gallery Guide.The aquatint of the Jama Masjid by Thomas Daniell (Plate 1 Oriental Scenery Part 1, 1795, V& A Museum no IS 242 (1) 1961), was also an important part of the set of drawings made by them. As the first of a set of 24 Prints published by the Daniells in 1795, it was ‘the first image produced by them to be seen by the wider British public’, as the Gallery Guide points out. Both Simpson and the uncle and son team of Thomas and William Daniell had some reputation as artists which they were seeking to capitalize on and extend through their Indian drawings. I would like to explore the ways in which these well-known artists of their time have looked at these two famous architectural buildings, and what their drawings as first-time visitors to India, have to say about these buildings. We all know that even if there has been no deliberate attempt at dramatizing a space, any account or representation is inevitably an individual perception which can never be completely objective. Thus, first and foremost, these paintings represent the artists’ personality in what they seek to highlight or focus on, through the paintings while portraying the sights they have seen. Taken alone, they are impressionistic views (even when they seem to be completely realistic) of India as seen from the eyes of visitors from a very different culture and context; with the express purpose of making their fortune by employing their artistic talent to draw pictures of the ‘mysterious east’ for audiences back home in Europe. For instance, William Simpson (1823-1899) was commissioned to go to India by a well-known London lithography firm to sketch well-known sites associated with the revolt of 1857. Thomas and William Daniell came to India a little more than half a century before Simpson, again with the intent of drawing picturesque views of the dramatic Indian sights for audiences back in England. Though only about 50 years separated the visits of the Daniells and Simpson, the political circumstances were quite different during their visits. After 1857, the British connection with India was fraught with feelings not just of curiosity towards India and things Indian, but also feelings of anger, contempt, and possession. The war of 1857 marked a turning point in the relationship between India and Britain, and a break in many of the older cultural, social and political institutions in India. Delhi as the scene of intense fighting, the formal seat of the ‘Last Mughal’, as well as the rallying point of the forces against the British, aroused particularly strong feelings in the British public who had followed the events during 1857 with unabated interest. This meant that scenes in Delhi were invested with many meanings. The Daniell paintings as pre-1857 do not have the additional reportage of the post-1857 paintings. However, though they may be said to be without an obvious political agenda, they obviously had a commercial angle to fulfill. They needed to be dramatic enough, exotic enough and enticing enough to appeal to a large section of the British public, in order to sell well. 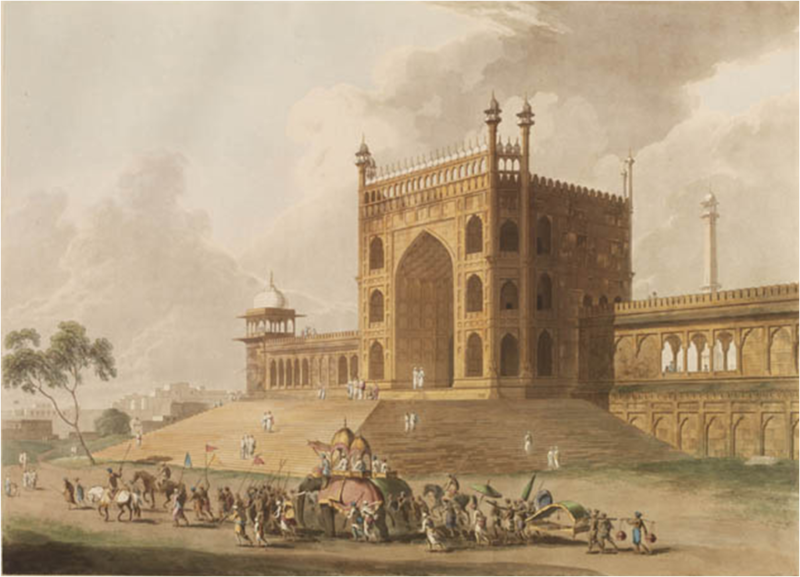 So the Jama Masjid painting, the first painting of the Daniell’s Set of Views, does not show the entire Mosque itself, but focuses on one part of it - its Eastern Gateway, the grandest gateway of the Mosque as told earlier by Bernier. This is in keeping with the style employed by the Daniells in their other paintings as well. Thus, while they are known to have used the camera obscura to ensure faithful documentation of details of landscape or building, they often deliberately played up elements of the natural and built landscape—sometimes substantially—to achieve greater compositional effect. This is clearly demonstrated in the book India, Yesterday and Today, Aquatints by Thomas and William Daniell, where the revisited sites of many of these sketches have been photographed from the same position as those of the original aquatints. Nonetheless, despite this playing up of certain elements, the Daniells late eighteenth and early nineteenth century aquatints of various parts of India, are an important reference for life in those years (1795–1803). William Simpson’s objective of coming to India was in a sense more focused. Simpson came to India after acquiring some fame in documenting the Crimean war of 1854, and was instructed ‘to sketch well-known sites associated with the heavy fighting of 1857 in and around Delhi’ (Gallery guide, Simpson’s biography). 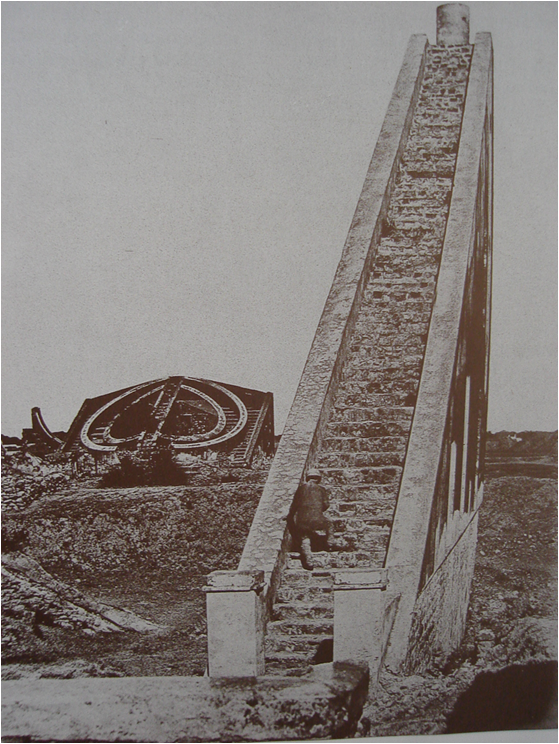 Interestingly, Felice Beato, a photographer who had like Simpson, acquired fame in covering the Crimean War also chose to record both the Jantar Mantar and the Jama Masjid. The choice of Jantar Mantar is interesting, since it does not appear to have featured at all in the fighting of 1857, which is what both Simpson and Beato were supposed to cover. So, in choosing to record this, we might say that they were going ‘beyond their brief’! The Jama Masjid, was of course the scene of direct fighting, but even if it had not been, as one of the most imposing buildings in Delhi it could not have escaped Beato’s attention, as indeed it did not of the Daniells. This is the reason perhaps that the Daniell painting is quite simply titled ‘Eastern Gate of the Jummah Masjid at Delhi’. The Simpson painting on the other hand, is more grandly called ‘Ancient Observatory, Delhi’. Perhaps Simpson was trying to justify his inclusion of the Observatory by investing it with an obvious ancientness? It is also interesting that Simpson has chosen to highlight the ruinous aspect of the Jantar Mantar, throwing in some skeletons next to emaciated twigs and a lean dog for good measure. The Daniells, conversely choose to depict the Jama Masjid as an intact structure, in good ‘working condition’ and its magnificence heightened by the majesty of the elephant procession in front of it. Would the artists have actually witnessed these scenes in front of the buildings? Or have the human and animal subjects in the foreground been transposed on to the monument for artistic effect? On the face of it, it appears unlikely that two buildings in the same general area, subject to the same climatic conditions, would have weathered so differently during a similar time-span. 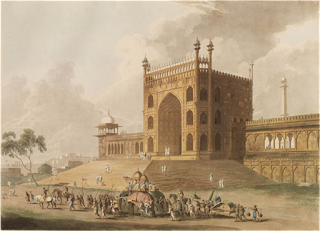 The Daniell painting was drawn a hundred and fifty years after the construction of the Jama Masjid; similarly Simpson’s painting of the Jantar Mantar was also made about a hundred and fifty years after its construction. So, is it reasonable to believe that one building could have degraded so much over a hundred and fifty years ago, while the other was in such good condition? 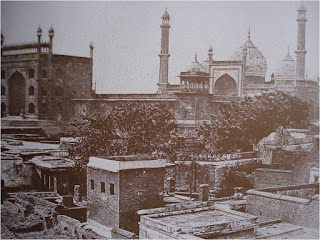 The Jama Masjid was within the walls of the imperial Mughal Capital, the most important congregational mosque which the Mughal Emperors also visited for prayer. Though Delhi had already been summarily sacked by the Persian King Nadir Shah and then by Afghan marauders fifty years before the Daniells’ visit, life within the city is reported to have revived fairly quickly, with its social and cultural institutions in place. 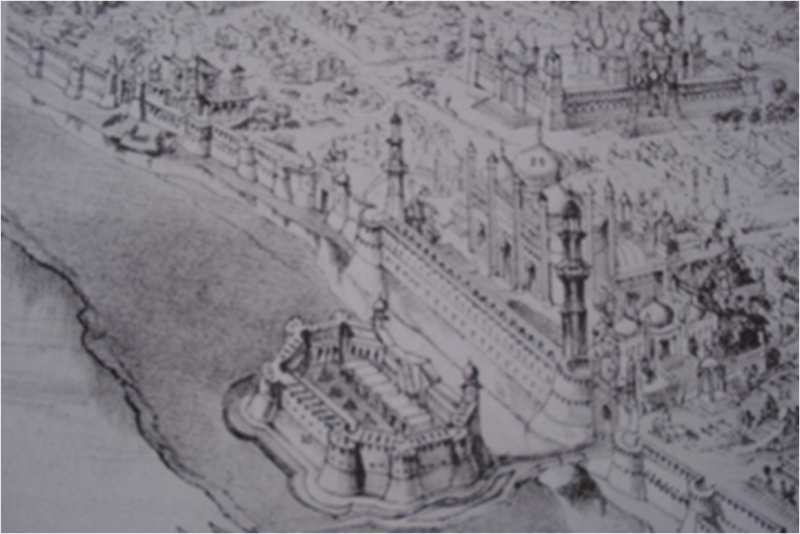 Contemporary accounts of the looting of the city state that ‘the Chandni Chouk, the Daribah Bazaar, and the buildings around the Masjid-i-Jama were set fire to and reduced to ashes’ (Tazkira of Anand Ram Mukhlis). However, they do not mention specific destruction of the Jama Masjid itself, which as a place of worship of the same faith as that of the invaders is unlikely to have been vandalized. Even the Jats and the Marathas who attacked Delhi in the late 18th century probably did not desecrate the Masjid. It is more than likely thus, that the Jama Masjid was more or less as it was depicted by the Daniells. Perhaps Emily had seen one of the paintings of the Daniells in the houses of her aunts and uncles in England? Whether or not she had, it is interesting how the same sight extolled by Bernier’s journal in the mid-17th century was translated into a painting by the Daniells in the late 18th century and again evoked by Emily Metcalfe in the mid-19th century. The Jama Masjid is also practically the first building that Emily’s father, Sir Thomas Metcalfe, chose to write about in his Reminiscenses of Imperial Delhie. However, the painting commissioned by him to illustrate his description of the Jama Masjid, the ‘Great Cathedral’ as he calls it, shows the interior of the actual mosque, and does not confine itself to the view of the grand steps. The Jantar Mantar on the other hand was well outside the then city walls, a mile and a quarter south-west. Its patron’s kingdom was many miles away, in Jaipur, and it had ceased to be a working Observatory shortly after Nadir Shah’s attack. The circle of the full moon, the glow of the fire in Simpson’s painting lend both romance and mystery to the strange shapes of the instruments of this observatory. Indeed, the very reasons that make us believe that the Observatory may indeed actually have been in a ruinous and deserted state, make it improbable that Simpson would have actually sketched the Observatory by the light of the full moon. The area of Delhi at that time and even later was home to wild animals ranging from tigers to jackals; and the Jantar Mantar outside the protection of the city walls would not have been a safe proposition to visit at night. 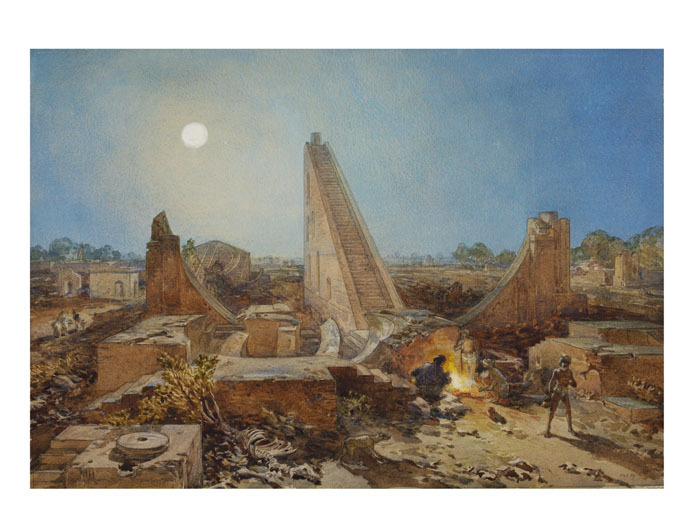 However, it may also be that by highlighting the fact that an ancient Observatory had been allowed to fall to ruins, Simpson was driving home a point more in keeping with his commission about portraying scenes of British victory. Namely, that even ancient important monuments were allowed to fall to ruin and decay in the reign of the Mughals? It is also a fact that after 1857, the entire Indian population of Shahjahanabad was turned out of the city. With no recourse to food or shelter, they may have actually taken refuge in the abandoned observatory’s masonry structures. Simpson may have actually seen such refugees or perhaps heard of their stories. So what direct information can we derive from the paintings about the buildings? We are told that Simpson arrived in Calcutta in 1859 and traveled over India, making his ‘rapid pencil drawings’ which were finished as water-colours after his return to London in 1862. So about two to three years elapsed between drawing his subjects, and preparing them for publication. There was thus, a substantial time gap between seeing, recording and finishing his paintings. Nonetheless, if we consider the Jantar Mantar and how it has been rendered, we find that its instruments are more or less recognizable. We can see the Samrat Yantra, the Misra Yantra in the distance with the guard house of the Observatory next to it, and the pair of very broken down JaiPrakash Yantras in the foreground next to the skeleton. There is another platform with a roud disc on it shown before the West JaiPrakash Yantra which has since then disappeared. We know that Jai Singh built metal instruments at the Delhi observatory before making his immovable masonry instruments here. Perhaps the unidentifiable platform in front of the JaiPrakash Yantras was the base for some such metal instrument? We cannot really say, since there is no specific textual evidence which describes a Yantra of this shape next to the JaiPrakashs. The proportions of the Samrat are impeccable, and much like the extant Yantra today. It is in far better shape than the other Yantras depicted here. This is in sync with historical records. 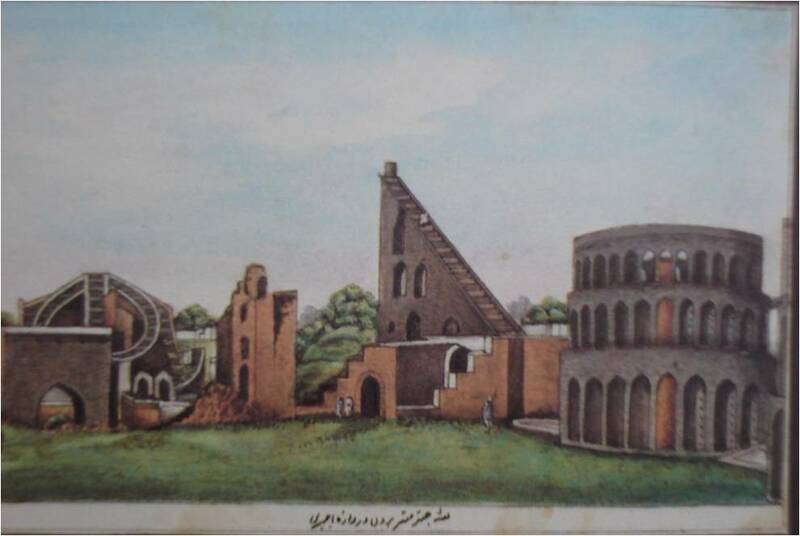 Thus, while Syed Ahmad Khan, in his book about the historic buildings of Delhi, Atharal Sanadid, first published in 1846-7, states quite clearly that the Jantar Mantar’s ‘instruments have fallen into disuse and are almost in ruins’, it is recorded that the newly formed Archaeological Society of Delhi requested Raja Rama Singh II of Jaipur to conserve the Observatory. As a result, in 1852 the conservation of the most imposing Yantra, the Samrat, was undertaken with funds and expertise from Jaipur. This conservation would have taken place less than a decade before Simpson’s visit, and perhaps explains the reason why the Samrat looks in so much better shape than the other visible Yantras. However, when we compare Simpson’s drawing with a view of the Observatory at around the same time by a local artist commissioned by the British Resident of Delhi, Sir Thomas Metcalfe, it shows something quite different. It is the Samrat which appears more ruinous than the other Yantras, especially the JaiPrakash Yantras which are shown to be fairly intact. The drawing depicts scattered mounds of earth and occasional crumbling edges of the masonry instruments, set amidst fairly pleasant grassy stretches with trees in the distance - a far cry from the desolation of Simpson’s scene. The perspective is faulty and the proportions of the Yantras too are not as assured as Simpson’s drawing. But should we automatically assume that a less skilled artist will also be a less accurate observer and recorder? Not necessarily. In fact, a more confident and skilled artist may actually find it simpler to depart from reality, to fill in details from imagination. In the absence of absolute corroborative information, these thoughts cannot be more than speculations. Be that as it may, they demonstrate the selective nature of perception and memory and explain why even an overwhelmingly recognisable subject, when represented many times by different artists, does not appear exactly the same in its different versions. The fact is that it gets invested with different meanings despite being rendered in a natural or figurative way. The Daniells too had chosen to draw the Delhi Jantar Mantar in their collection of views. Like Simpson, they focus on the Samrat Yantra; however the only other recognizable Yantra in their drawing is the Misra in the distance. The Observatory is not as obviously ruined as it is depicted in Simpson’s version. In fact, though part of the Samrat’s lime-plaster has come off revealing its underlying masonry, the Yantra itself is more or less complete. Again, if we look at the larger historical view of the area, we realize that the Daniells saw the Jantar Mantar before its conservation was undertaken in 1852, and after the attacks and vandalism on it by the Jats. So, was it actually in worse shape than the Daniells painting? Or was it in better shape than Simpson’s painting? We can look for at least partial corroboration in another contemporary pictorial source – Beato’s photograph of the Jantar Mantar. Both Beato's photograph and Simpson’s drawing date from practically the same time. 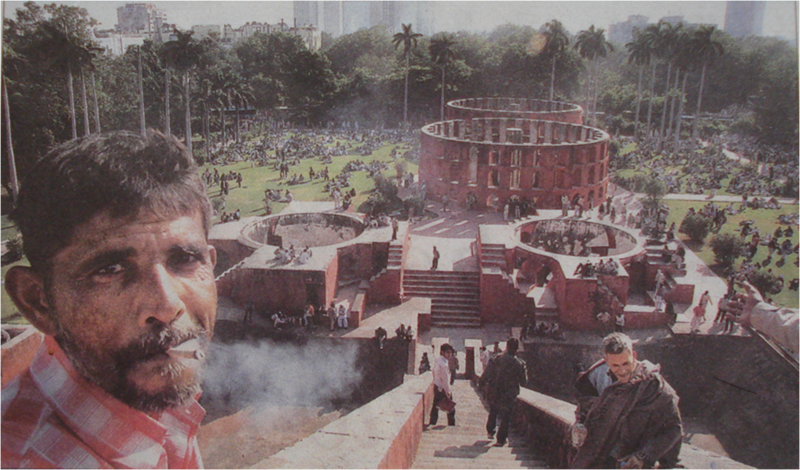 Beato’s photograph of the Jantar Mantar concentrates on the steps of the Samrat, and underplays the exotic element that Simpson seeks to highlight. Though Beato’s photograph does not cover as much of the Yantras as does Simpson’s painting, it is difficult to say exactly how much of the surroundings have been played up by Simpson. Nevertheless, the close up of the Samrat reveals that while the steps of the gnomon and its surrounding parapet are relatively intact, the dials of the Samrat as well as the Misra Yantra in the background are indeed, at least partially ruined. Beato, like Simpson, also imposes props on his photograph though his props are quite different. The thin Indians and the lean dog in Simpson’s painting are replaced by the European in the sola topee. The European positioned on the steps of the Yantra, perhaps for scale, perhaps to reflect the ascendancy of the British in the Indian political and physical landscape is not a chance bystander or passerby but is a deliberately added element to the photograph. The same European appears in several of his other photographs too. However, though they use different props, and appear to evoke very different images – Beato’s still, stark and grainy planes and angles contrasted with Simpson’s soft colours and movement, as much a constraint of their different mediums as perhaps their individual artistic expressions - the underlying message in both works appears to be the same, namely the desolation of the native landscape in the aftermath of 1857. 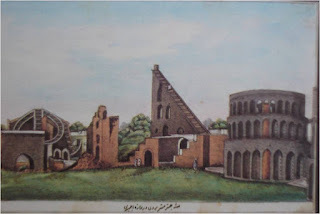 It is also revealing to contrast the manner in which the Jantar Mantar and the Jama Masjid are presented in these older drawings and the manner in which they are photographed today. Thus, practically all the older drawings of the Jantar Mantar either only show the Samrat Yantra, the largest Yantra of the Delhi Observatory, or give it prominence in the composition. Yet, today, almost all images of the Delhi Jantar Mantar show not the Samrat, but the far smaller Misra Yantra – ranging from the photograph printed on the ASI’s entrance tickets to the coffee-table as well as the scholarly publications on the Jantar Mantar. 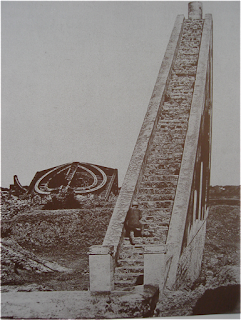 The reason for this is probably because the Observatory’s original entrance has shifted ninety degrees, and the way in which it is now entered means that the Misra Yantra, the last and smallest Yantra of the Observatory, is encountered first of all. Similarly, most images of the Jama Masjid today either focus on close-ups of the steps of the entrance gates or feature its internal courtyard with the domes of the mosque looming up behind. Views such as those that the Daniell painting depicts are physically difficult to draw or photograph because of the crowding in of the mosque’s surroundings. This shows the extent to which physical space and how we spatially approach a building or a monument affects how we picture, redefine and represent our past. Thus, to sum up, we see that individual and partly imaginative as they are, the paintings give important information about the immediate and the larger context of the scenes they depict. Moreover, they do not just document and evoke a time and a pace of life that is now lost, they also help to illustrate, elaborate and corroborate certain historical facts. And finally, they remind us of the importance of symbols in a people’s memory. As we completely overwhelm the original spatial and architectural quality of the Jama Masjid, and desecrate the Jantar Mantar under the guise of people's protets, it is time to realize the importance of how the past once appeared to inhabitants and to visitors - and what may lie in store for us if we forget completely.